Berlin-based indie natural brand April Aromatics has launched Agartha, a new limited edition fragrance. [...] This scent is a journey into the inner earth, or our inner earth. A place, remembered from childhood dreams, which brings feelings of peace and tranquility. A New Earth paradigm is here, ready to be experienced on mystical waves of delicate fragrance. Shamballa or Shangri-La are said to be the names of the capital city of Agartha. This mythical place has been called the Land of Radiant Spirits, the Land of the Living Gods and the Land of Wonders. Notes reflected in this elixir are sweet, light and uplifting. Fruit accords from the garden of Eden transition from the top into Mimosa blossom absolute. Honey, Hay and Cardamom build the heart. Tobacco leaves, Labdanum, Patchouli and Oud are ever so slightly supporting the scent in the base. This perfume is meant to be inhaled from a tissue or handkerchief, from there it unfolds its true colours. It is a mysterious and wondrous scent, much like Agartha itself. [...] Created on the super Moon of 2016, and infused with Herkimer Diamond and blue Agate. Additional notes include fruit accord. 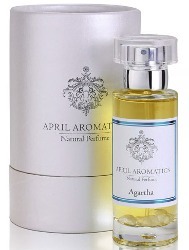 April Aromatics Agartha is €142 for 30 ml Eau de Parfum. I scratched my head when I read this. The suggested wearing is spray it on a tissue or hankie and inhale…does this mean Don’t put on skin? If this is the case, then it probably should be marketed as a type of linen spray. That said, I may have found my anti-stink antidote to smelly commutes! I was assuming if she meant it could not be worn on skin she would have said so, but what do I know! It does sound fantastic to me.